1998 Accord EX V6 with 172000 miles just sitting at light and car quit. No codes. Engine is getting fuel but no spark at all. Timing belt was replaced at 137000 miles and seems to be OK. Replaced ignition coil, dist. cap and button. NOTHING. I saw a similar problem and the mechanic replaced a relay located in the middle of the fuse box under the hood. It's a brown module held in place by the legs of a 100 Amp fuse and a 50 Amp fuse and has a three connector plug on top. I've been told that this is the fuel pump relay and also delivers power to the crank sensor. There is no part number on this item and neither O'Reilly nor Autozone can identify the part. What is it, and could this be the problem? Engine is getting fuel but no spark at all. Is the fuel pressure correct? Does it have injector pulse? Fuel pressure is correct and the injectors are working. We have no spark on any plug. You've been around here long enough to realize that I know when somebody is short cutting. Your answers tell me you didn't even check it. You missed the message, and you could lose your front row seat at next month's Sherlock Society meeting. The only short cutting I did was in my wording. I'm working on this car with another guy, and we did, in fact, check the fuel pressure and the injectors. He's not a short-cuttin kinda guy, either. We had to remove all plugs to dry them out because we were flooded. I thought you knew me well enough to know that I don't make stuff up. So, after all that, we still have no spark. I also don't know if the Electronic Load Detector located in the center of the fuse box has anything to do with the ignition. I guess you won't be at next month's Sherlock Society meeting either because the wiring diagram above tells you exactly what you need to check to figure out why you have no spark. The problem was the igniter in the distributor. And with that replaced the car is running great. 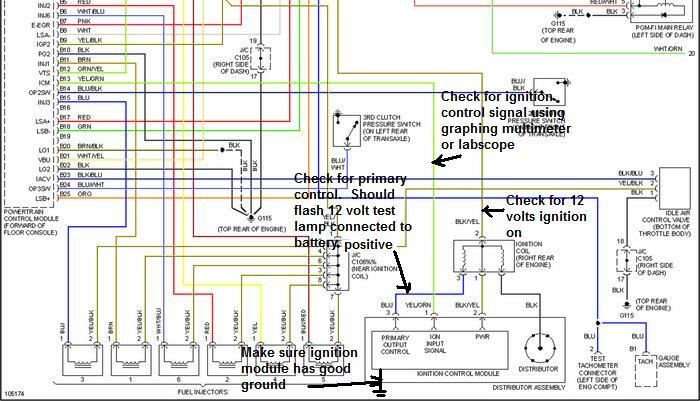 Thanks for the schematic. Big help.